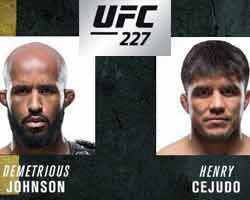 Review by AllTheBestFights.com: 2018-08-04, pretty good fight between Demetrious Johnson and Henry Cejudo 2: it gets three stars (UFC Fight of the Night). The Ufc Flw champion Demetrious Johnson entered this fight with a pro mma record of 27-2-1 (59% finishing rate) and he is ranked as the No.1 flyweight in the world. ‘Mighty Mouse’ suffered his last loss when he faced Dominick Cruz in 2011 (Cruz vs Johnson), since then he has collected one draw and 13 consecutive victories beating Wilson Reis (Johnson vs Reis) and Ray Borg in 2017 (Demetrious Johnson vs Ray Borg). His opponent, the 2008 Olympic freestyle wrestling gold medalist Henry Cejudo, has a record of 12-2-0 (42% finishing rate) and he entered as the No.2 in the same weight class. He lost two consecutive bouts in 2016, against Demetrious Johnson in their first bout (Johnson vs Cejudo I) and with Joseph Benavidez (via split decision, Benavidez vs Cejudo) but then he has won over Wilson Reis (Cejudo vs Reis) and Sergio Pettis (Henry Cejudo vs Sergio Pettis). 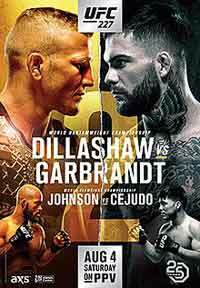 Johnson vs Cejudo 2 is valid for the Ufc flyweight title; undercard of TJ Dillashaw vs Cody Garbrandt 2 – UFC 227. Watch the video and rate this fight! Review by AllTheBestFights.com: 2018-08-04, pretty good finish between Cub Swanson and Renato Moicano Carneiro: it gets three stars (UFC Performance of the Night). The black belt in Bjj and judo Cub Swanson entered this fight with a professional record of 25-9-0 (60% finishing rate) and he is ranked as the No.15 featherweight in the world but he comes off two consecutive defeats, with Brian Ortega (Cub Swanson vs Brian Ortega) and Frankie Edgar (Frankie Edgar vs Cub Swanson 2); before losing to Ortega, in 2017, he had beat Artem lobov (Cub Swanson vs Artem Lobov). His opponent, Renato Moicano Carneiro (black belt in Brazilian jiu-jitsu as well), has a mma record of 12-1-1 (42% submission victory rate – he has never won via ko/tko) and he entered as the No.17 in the same weight class. He also lost to Brian Ortega last year (Renato Carneiro vs Brian Ortega) but he came back to win in 2018 with Calvin Kattar (Renato Moicano Carneiro vs Calvin Kattar). 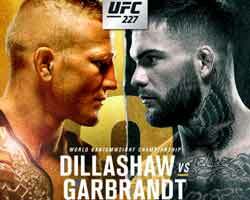 Swanson vs Moicano is on the undercard of TJ Dillashaw vs Cody Garbrandt 2 – UFC 227. Watch the video and rate this fight! Review by AllTheBestFights.com: 2018-08-04, great performance by both fighters: Pedro Munhoz vs Brett Johns is close to get four stars! The black belt in Brazilian jiu-jitsu Pedro Munhoz entered this fight with a pro record of 15-3-0 (73% finishing rate) and he is ranked as the No.13 bantamweight in the world but he comes off the loss with John Dodson (via split decision, John Dodson vs Pedro Munhoz); before this fight, in 2017, he had defeated Damian Stasiak (Munhoz vs Stasiak) and Rob Font (Pedro Munhoz vs Rob Font). His opponent, the black belt in judo Brett Johns, has an official mma record of 15-1-0 (47% finishing rate) and he entered as the No.18 in the same weight class but he also lost his only 2018 fight, against Aljamain Sterling (Brett Johns vs Aljamain Sterling); before this bout, in 2017, he had won over Albert Morales and Joe Soto (Joe Soto vs Brett Johns). Munhoz vs Johns is on the undercard of TJ Dillashaw vs Cody Garbrandt 2 – UFC 227. Watch the video and rate this fight!